Hitting the sweet spot right between the bankruptcy-inspired rehashing of all of MGM's old catalog titles, and the Bible movie craze that someone in Hollywood argues America is having, Deadline reports that MGM is creating a new version of Ben-Hur, the Roman Empire-era tale that was previously made into a classic film starring that embodiment of Jewishness, Charlton Heston. 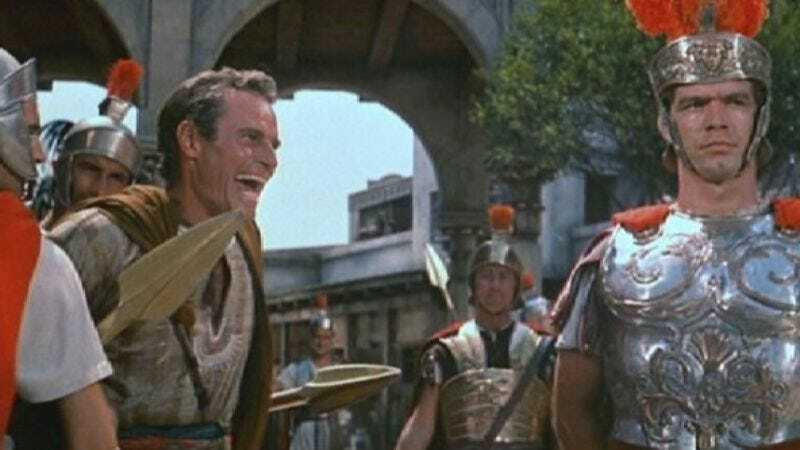 Given that MGM previously sold the rights to Ben-Hur to Ted Turner, just like a galley slave who finds a proud new life as a celebrated charioteer through faith and cunning and taking advantage of public domain, the new Ben-Hur will not technically be a remake of William Wyler's 1959 film, but rather a new adaptation of the 1880 novel from Lew Wallace. Deadline further says this new film will be "much different" from its predecessor by being more "faithful" to the book, concentrating more on telling a parallel story of Jesus—a plotline that already factored greatly in the 1959 version, but okay—and possibly by not casting a burly WASP guy in the main role. Nevertheless, the new film will also climax with a massive chariot race, because that's why you're paying to see a movie called Ben-Hur. Jesus and chariots—that's what you want, that's what you're gonna get.